First let's step back to something which predates the addition. (The tale that follows will also be a good place to thank some generous people who helped make this project a reality.) The setup I use currently dates back to the mid '80s, when the loft studio began to expand first past the Moog synthesizer, the GDS digital synth, and even the two Synergy synths. Here's the extent to which the configuration grew up to 1986 (to the left), during the next six years (center), and then again after 10 more years. The greatest changes happened between '86 and '92. Two new shorter rack cabinets were added and filled up too quickly. I learned about the creative solutions of "Thinkertoy" components (made by Ultimate Support ). Two custom stands now hold most of the non-rack equipment. These took several weeks to build, a lot of trial and error, but were fun and well worth the adventure. A Kurzweil MidiBoard is now the main keyboard controller, with two not so often used Synergy synths above. Note how modest the additional changes are by the third photo (I just took this quick digital pix myself right now, which is why no one is to be seen, as is the case with most of the pix in this new section). There are only a few module changes, that and the omnipresent updating of computer equipment. Goodness, I just noticed that the stuff on the wall, the paper mache bird my dad made, have not moved much in a decade! In such an evolving field as electroacoustic music it's probably unusual to maintain most of the same configuration for 10+ years. Of course I'm much more interested in making music than playing with technology. Once a fast, convenient setup was achieved it seemed too good to mess with in some trendy "chasing one's own tail." I've come to depend upon the familiarity of everything, but then for most earlier composers stability of a working environment isn't worth much discussion. Traditionally a composer works at a decent piano or the equivalent, a handy drawing board to one side, with some manuscript paper and a pencil with a good eraser -- what's to become outdated there? 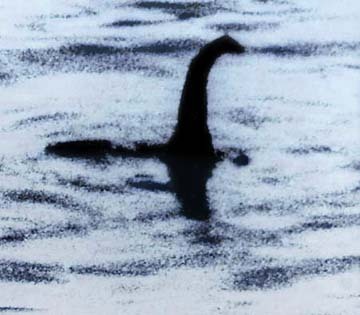 Perhaps some audio and video equipment is placed nearby, especially to work with another medium, like scoring a film. 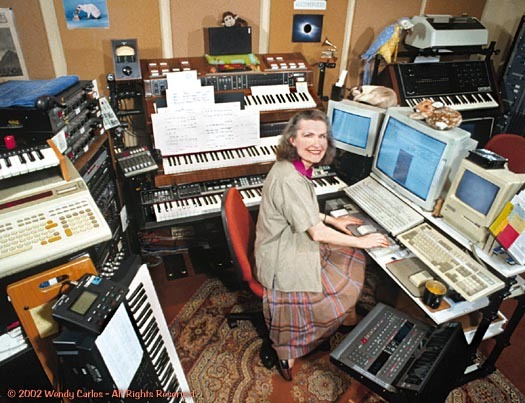 If you create music at the start of the 21st century, though, you likely rely on some kind of computer, even if only for notation. You may use it with sequencing software to drive a few synthesizers, perhaps organized in a semicircular work space. There'll be a monitor and keyboard at center front, the rest of the equipment distributed around and within an arm's reach, or a quick scuttle over the floor on a castered office chair. The only stability becomes what you insist upon, no more, no less. You could easily change the entire configuration every month, and many musicians do. That's fine for more flexible, younger minds than mine, or those who have yet to find themselves musically. I LIKE to know where everything is instantly. My studio has become a friendly place to work, where the focus is the work itself, aside from the inevitable troubleshooting distractions that anyone who uses the latest music tools is all too familiar with. If you checked out the other end of my studio before 2002, you'd have seen this niche, directly in front of the seldom used Moog Synthesizer. This is where I spent hours with two Kurzweil synths, the K2000S and K2000R, on most of my recent sound design work. Chris Martirano was my Kurzweil contact and musician friend who helped me get the 2000s up and operating, customized, and solve some initial bugs (as he did again for the K2600's described below). This is the arrangement used on "Tales of Heaven and Hell," and the filmscore for "Woundings." The small Yamaha keyboard at top left can play the rack-mounted K2000R, but most of the time I preferred the convenience of the regular K2000S, to the right. Long MIDI cords tied both instruments over to the rack sitting to the left of the 88-note Midiboard you can see up above, where two MidiTimePiece interface boxes are mounted. These are MotU units, and allow Digital Performer to operate the Kurzweil synths from across the room. There's also a vintage Yamaha SY77 nearby, and a newer Korg Z-1, too. They're dandy for certain kinds of timbre creation. 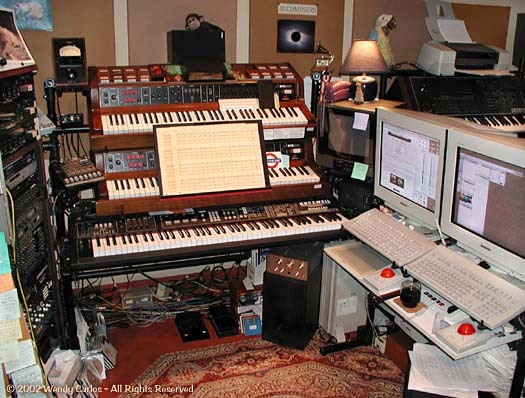 In the summer of 2001 I added a K2600S to the studio -- first new synth in some years. The first month I couldn't get enough of the convincing "triple strike" piano sound, and began practicing long hours again, as I used to. It was great to get back at making music, the skills of moving fingers precisely and expressively. The chore of remastering all my older albums had dragged me away from that. I'm not a great performer, as I've often said, but I do sight read well, and enjoy improvising new things as well as hacking away at the classical repertoire. When I ordered the K2600 online, I noticed a small set of Kurzweil disks which contained pipe organ sounds and samples, both classical and theater ranks. That sounded interesting. I'd taken several months of organ lessons during high school, but as we couldn't afford an organ, these were largely wasted. 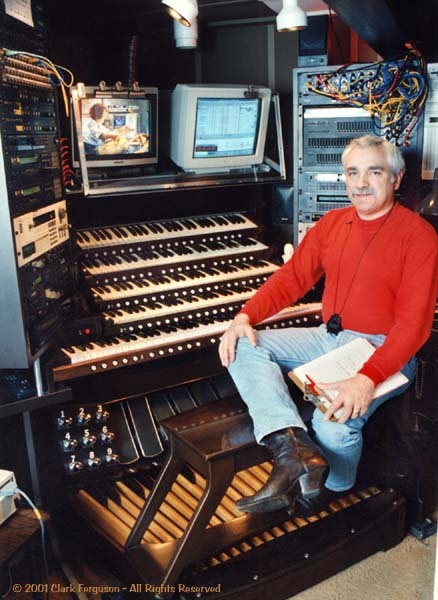 But my fascination with pipe organs was a major influence on the path that led me to the synthesizer. A few years ago a nimble-fingered musician friend of many years, Clark Ferguson (he's also the custom instrument manager for Allen Organ Company) built something directly inspirational to this project. It was a five manual, with AGO pedalboard, custom instrument for his home studio, which planted a seed for what became "Wurly II." Talk about the serendipity of life, at least when the magic is behaving itself. 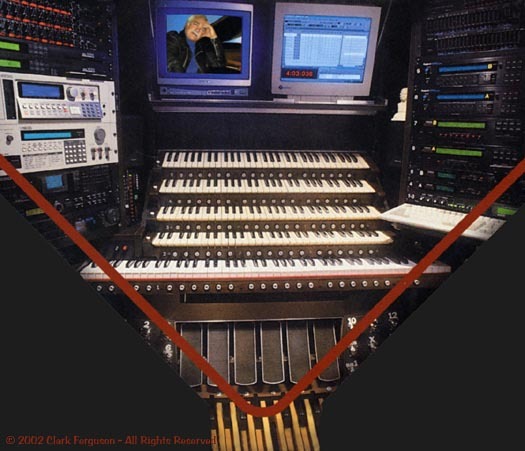 Let me show you his impressive fully MIDI synth, "pipe-organy" instrument, in this scan, below left, from the cover of his recent "Clark Ferguson -- Film Scores" CD. Clark really knows how to play this elaborate instrument, too. The second photo shows him taking a photo break in the middle of work scoring a film project. Looks like great fun! Something old and new were gracefully combined, same path I was heading down with a powerful new musical tool, a great feeling keyboard, about to try out some pipe organ sounds. After loading these into the 2600, as usual it took some time to organize and customize the new programs with all the expressive "hooks" I'm used to. I couldn't help but smile to be exploring a medium which I'd ignored pretty well since graduate school. The VAST engine of the K2000 / 2500 / 2600, along with decent samples of real pipe ranks, is a pretty heady mix. Everything you need to create a really impressive replica of "The King of Instruments" is right there. You can then bring it into the 21st Century, add powerful digital synth tricks, certainly some velocity and aftertouch sensitivity, morph pipe sounds into new hybrids based on a mature art form of musical timbre. Add other kewl sounds, like some of the definitive strings Gary Garritan has been assembling so meticulously (read all about his sound libraries HERE), toss in the best of one's own custom sounds and samples. Exciting stuff, methinx, sans any hype, and room to grow in. The sounds I heard from those first organ disks were not quite so "wonderful" as all that, but they were very good, enough to impress an ol' curmudgeon like me. In the summer of 2001 I wondered if there was a way to add on some kind of MIDI pedalboard, even a small one, so that I might be able to practice some actual organ parts with it. I spent several weeks searching for something I could afford, and tried out a few of the options in the local music stores. Um. What I learned was that there were two distinct camps. You could find a few reasonable one octave pedalboards which supported velocity sensing, and some other convenience features from MIDI that would be depressing to give up. A few were rather flimsy affairs, and jumped around the floor when played briskly. Yuk. The other camp supported what you'd need for an electronic organ: standard organ pedalboard size, but no velocity or aftertouch, no program changes, or customization, other things I was unwilling to put up without. I also didn't have the tools, experience and parts to build my own from scratch, as Clark had. Nutz. Then I remembered that my acoustic piano up in the front of the loft has a retrofit Gulbransen optical pickup system. It's a wonderful device, and has been dependable and powerful and most welcome. Unfortunately, it's not in the studio proper, where I do my composing and recording. So it's gotten less use that I hoped for originally, when it was given to me by some generous people at the company. I wrote again to my contact there, Jack Butler. Did they have any devices that could turn an old organ pedalboard into a good MIDI controller? The answer I got back from Jack was sorta no and sorta yes. No -- they did not have an actual pickup device for pedalboards. Yes, they did have a solution that might work. One of their engineers had come up with an "off the record" modification to their KS-20 unit recently. 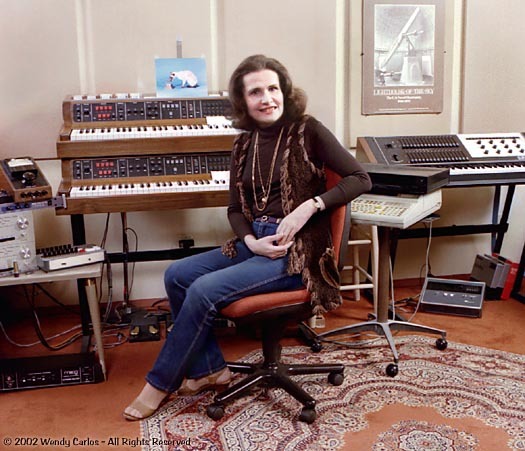 It was one of those amusing stories, his daughter was a church organist, and had started to use a pair of Gulbransen pickups beneath the keys of the manuals, so she could save her performances and improvisations each week via a MIDI sequencer. Ah -- but the pedalboard -- what to do for that?! Was there any way her engineering dad could figure out to reproduce those notes as well? The solution he devised was extremely clever and logical. I'd have tried cutting up a keyboard strip and mounting the individual note pickups along a wood strip, one pickup beneath each pedal key. Wire them together again. That ought work. But it was a lot of risky work, tearing apart the printed circuit boards like that, one might damage the whole thing. Instead he'd taken a full 88-note strip, disassembled it into the four 22-note boards that make it up, and then mounted them on wood supports in four overlapping segments beneath the pedalboard keys. There was at least one pickup on every note. THEN -- you'd tell the onboard computer what sensors were going to be played by which notes and "map out" the rest (many pickups fell in the cracks, only about a third would be useful, due to the vastly different note-spacings). The procedure was simple -- just play the pedals one at a time slowly, from lowest to topmost note. And a new software subroutine he added did the rest. Damn clever. Jack suggested I might consider this kit, even though the company did not formally "support" organ pedal installations. Other customers already were using it that way, though, and all reported good to excellent results. I decided to give it a try, since my old and not often used Yamaha Electone E-5 organ has a very study and attractive 25-note pedalboard. If I could retrofit the new pickup boards beneath this, I might be in business, and it would cost a lot less than a new similar sized board, even forgetting for a moment about velocity and pressure sensing (btw- both poly and channel pressure are supported by Gulbransen -- hey!). Yes, it would be a compromise, the E-5 doesn't use a full AGO 32-note set of pedals, but the smaller flat but radiating 25-note version made popular on Hammond and other electronic organs. Since I'm no organist, and seldom would need the extra top seven notes, this seemed a reasonable place to start. It was awkward and dangerous to leave it there, so I hacksawed the base plate at the seam for the top circuit board. Jack kindly provided me with some extra connectors, so I could improvise a short extension cable, and mount that top board separate from the rest of the strip, while still connected electrically. It will provide several useful WurliTzer-style trigger pedal keys someday, since these sensors are still active, if now unused. After all the modifications it was time to test the whole rig out. Various effective and insightful MIDI expression pedal ideas came from friend Clark (he even sent me two mint Allen expression shoes--gorsh! ), and also lots of practical feedback, while I tried to get this "spit and band-aid" test assembly up and operating. And here's what sat in the studio for several months of trial and practice, clumsy, ugly, but effective. Hey, it woiks! For the temp setup seen below the 2600 rests on one of the old Synergy (Crumar) synth stands, the K2000S awkwardly placed on top. The customized pedalboard had to sit 2" up in the air on the synth stand's legs and a sturdy foam block, which made playing quite constricted, but this was only a temporary setup, after all. That's the E-5's organ bench, also refinished, and the home made music rack from the main studio MIDI setup seen up at the top of this page, here balanced on the K2000. A quick observation: it was a disconcerting experience at first to have a touch sensitive pedalboard -- I sounded like a spastic pogo stick rider: "bip - BA! - bip - bip - BA!" Never learned THAT skill before, even as my fingers take it for granted. I found that a typical toe depress was MUCH louder than a typical heel depress, for example. Ditto black notes vs. white. That's probably how one pedals an organ, just never noticed it before. But, I'm pleased to report, after about a month's worth of practice you learn pretty quickly how to play expressively via foot, and discover so many musical advantages that "mere" organ pedal touch (also organ manual touch) seems rather flat and, yes, "insensitive"... (one can't help but smile at the irony here, in that the earlier direct mechanical or "tracker" style organ action provides a natural touch sensitivity, mostly of the attacks, which was lost when pneumatic, and then electrical action was added -- win a few, lose a few).